Europan is this magic design competition for professionals under 40. Winning the Europan proved for many young architects the starting point of their career. Thursday 3 December all over Europe the winners were announced. In his introduction of the Europan 13 theme The Adaptable City, Thomas Sieverts president of Europan Europe wrote: ‘Europan needs to adapt to the changing con­ditions in the production of urban and archi­tectural environments and encourage new ways of designing and producing spaces’. Therefor Europan proposed to extend the theme of the adaptable city by taking account of three main changes in the conditions of production of European cities. The first change is less Welfare State and more self-organization. The second change lies in the idea that we live in a paradoxical society which has more than it needs, sufficient material resources, but uses them very badly. Therefore, not only for ethical and moral reasons, but also for reasons of fair­ness, society needs to move towards a cul­ture of sharing, because what we have needs to be better used in the future. The third theme is about the object ver­sus the project (process). In the future, in a sustainable, resilient city, architects need to be more responsible in what they do, they need to produce their projects over time and they need to become responsible for the “main­tenance” of their projects, their adaptability to the needs of new users. These three themes – self-organization, sharing and the project (process) – are the problematic context for the choice and content of the sites and as a basis of ideas for the competitors. The participants of Europan 13 could choose between two Dutch location, Streefkerk and Leeuwarden. 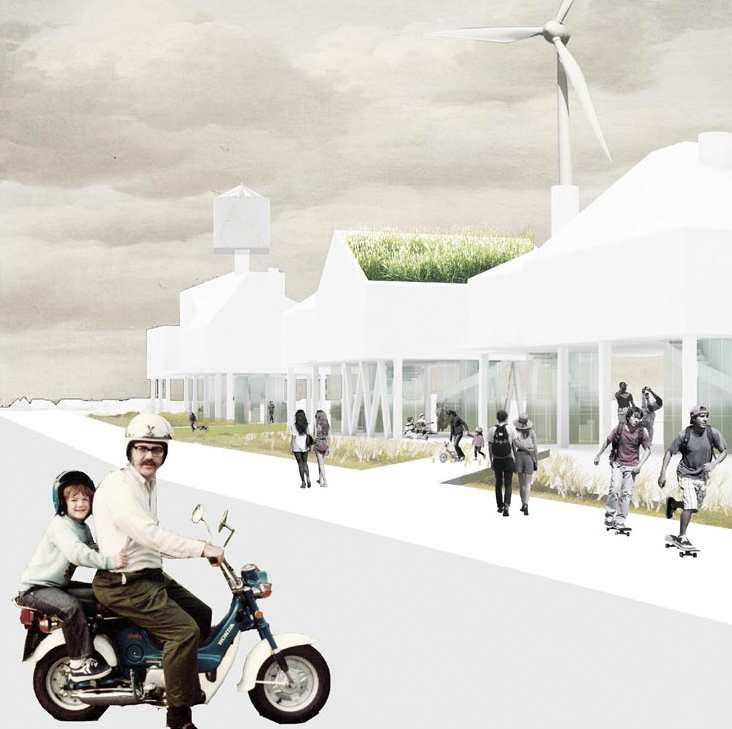 Requested are small-scale, conceptual proposals for reconstruction on, in, or along the dike, while respecting the urban and surrounding rural landscape. The technical design of the new dike and the existing architecture elsewhere along the dike should be taken into account. The idea behind the plan is to accommodate various ways of living in synchronicity with the earth, the street, the water and the air. 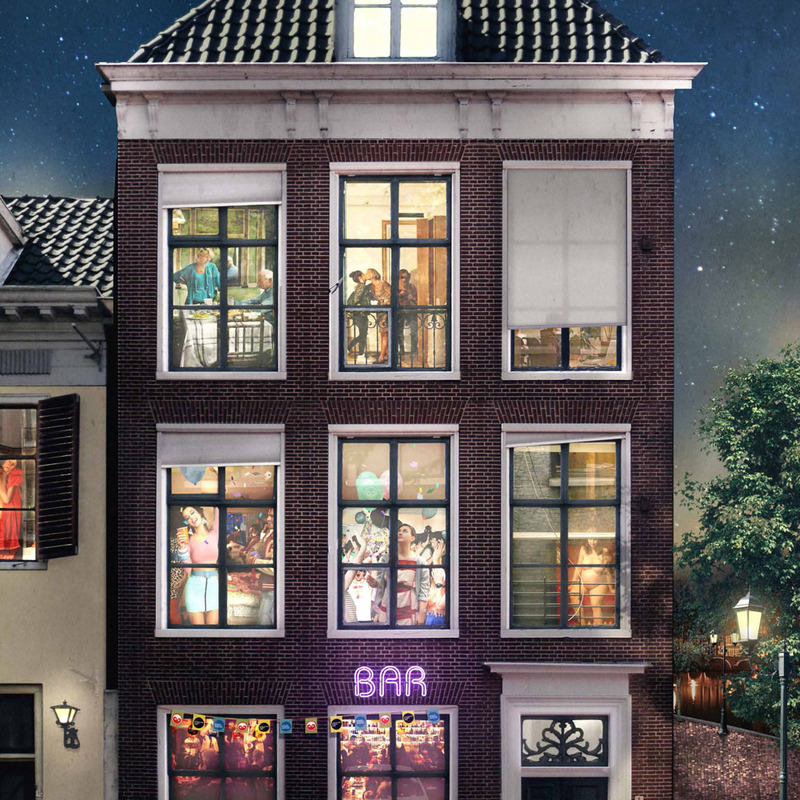 Splitting the volume of a traditional Dutch home horizontally creates an inter-space between heaven and earth, top and bottom, and public and domestic life. The columns, making it possible to jack up the housing are used as a skeleton for the building structure. A central vertical axis serves as a core of energy derived from external sources: water, wind and sun. The plan is consistent and well presented. It is a typical Europan plan in the sense that new housing typologies are used as a tool to address the assignment in Streefkerk. Furthermore, it is an innovative version of the socio-economic significance that dike housing has traditionally had. The new functions besides housing are not elaborated. Nonetheless, the public zone is intriguing and the plan has a number of interesting ideas, such as the new typology visible in the section, addressing current problems and future possibilities for rural development. The jury appreciated the fact that, in addition to this pilot location, the strategy (with adaptations) can also be implemented at various other locations. The proposed windmill may possibly not work, but the proposal to harvest energy and to broaden the scope of the programme to include a productive contribution to the project site is well chosen and original. The suggested architectural end result is attractive: a varied silhouette along the dike that almost looks as if it has always been there. The essence of this plan is the deployment of the dike as a connecting element between water and hinterland. The groynes (jetties) in the river make it possible to take advantage of the opportunities that the water presents. Housing will be constructed on the landwardside. This housing will be developed on the open space around the public areas, with the ground floor of the housing units functioning as a semi-private buffer zone. Local typology is deployed for the housing that stands on columns in order to withstand future dike reinforcement. This is more a strategy of “actions and ideas” than a specific solution for the Europan site. The creation of a “catalogue of actions” for an eleven-kilometre-long area along the dike does not present a conclusive end goal. The appearance of the housing is determined by the actions chosen for each situation. The variables are height, orientation, finishing material, positioning and view. This strategy is elaborated for twenty sites along the Lek, including the competition site. Examining the eleven-kilometre dike and devising a strategy for it is meaningful. The design elements emerging from the study are simple, and consequently probably easy to communicate. The jury considers the connecting pedestrian route somewhat artificial in relation to the unpretentiousness of the design matrix. 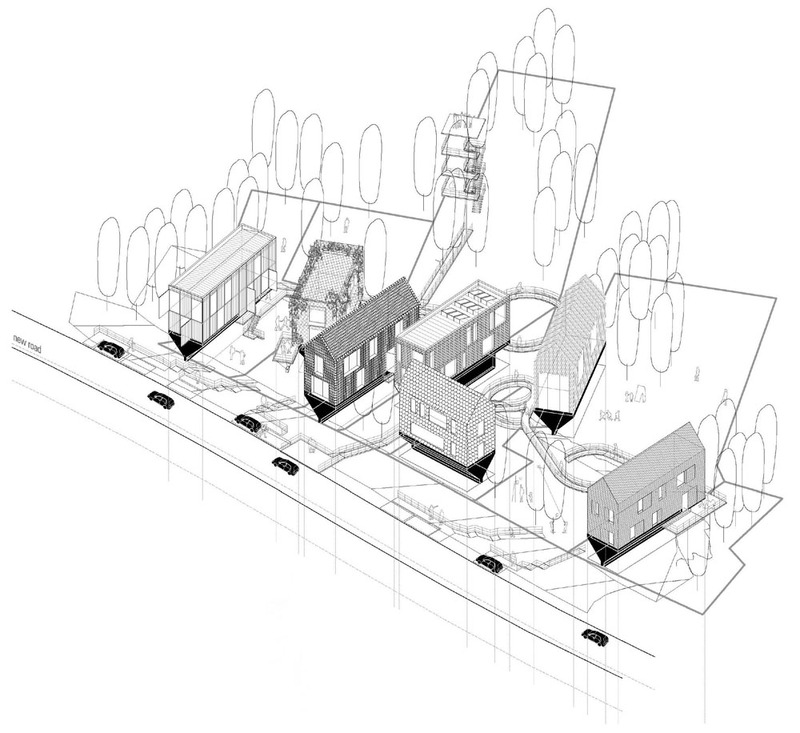 The positioning of the housing units perpendicular to the dike is an exceptional choice. Certain parts of the proposal are less convincing, such as parking along the dike and the housing being inaccessible by car. But this toolbox proposal stimulates the attainment of quality, both for architects, and for future clients who design their homes by choosing from a “catalogue of possibilities”. A strategic solution is requested to the present decline of the approach areas leading to the main locations in the city centre, with a detailed proposal at the level of a “city block”. This might involve connecting routes, functional transformations or creating appealing hotspots. Following a study into the present housing conditions, the plan proposes a bottom-up strategy to reactivate the city. Revitalising the city regenerates a market for shops, services are resumed and tourists are given a context for their visit. The point of departure for the plan is the shortage of hotel rooms during the events of Cultural Capital 2018. Better use of existing vacant buildings make newbuild unnecessary. Letting the empty space attracts new inhabitants who bring new activities with them that revitalise the city. In due course the inhabitants will generate new energy and the system will stabilise. 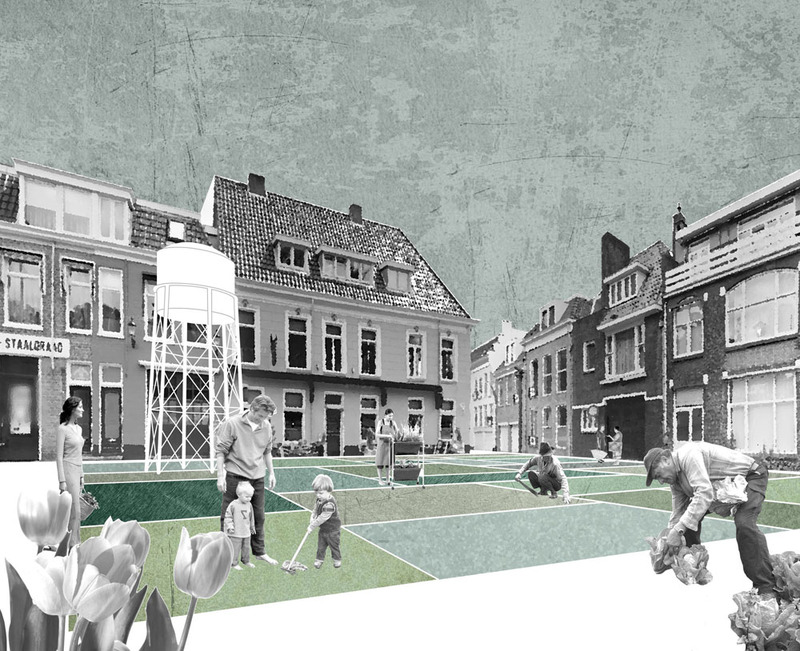 This unique plan tackles the problems facing Leeuwarden with a clever approach. The makers of the plan succeed in bringing the assignment down to earth in a communicative way. 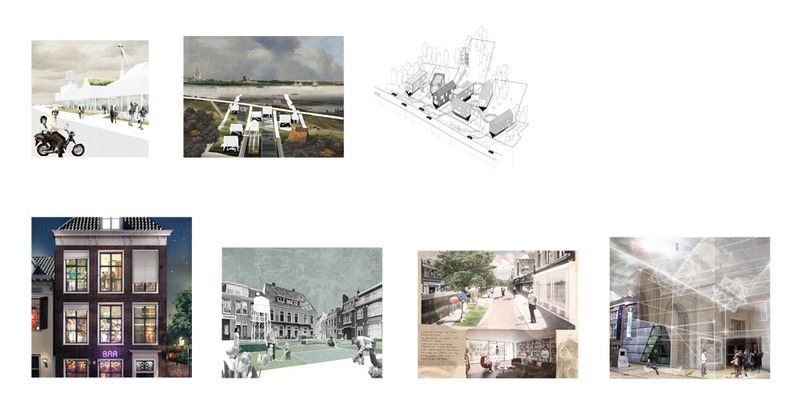 The plan visualises the city’s ambition of being progressive and it is very – perhaps excessively – concentrated. This proposal’s strength is its intelligent understanding of the assignment on different levels: the age group that Leeuwarden needs to support a dynamic environment, a novel interpretation of the Existenzminimum (subsistence level) for that group, and the potential economic value of the vacant spaces in the area. The jury values the radical approach and the discussion that this generates. A series of urban prescriptions” focusses on the city dweller on a small and medium scale, with remarkable consequences for the entire city. The entrants have created a catalogue that can be deployed in similar situations. The directions imply the creation of water nodes, strategic use of vacant premises, restoration of courtyards, filling empty locations and vacant buildings, transforming canal quays and housing, and temporary and flexible public areas with differing atmospheres. A well-presented, realistic and carefully-considered proposal. The point of departure, creating a traffic-free city, was well received. The plan is very different from other toolbox plans, it does not lead to an ill-conceived list of possible interventions. The extensive toolbox is applied at all scale levels, from the city in its entirety to the diverse street profiles and courtyards. The tools are realistic and sensitive to the present situation in Leeuwarden because they address spatial, social and programmatic subjects. 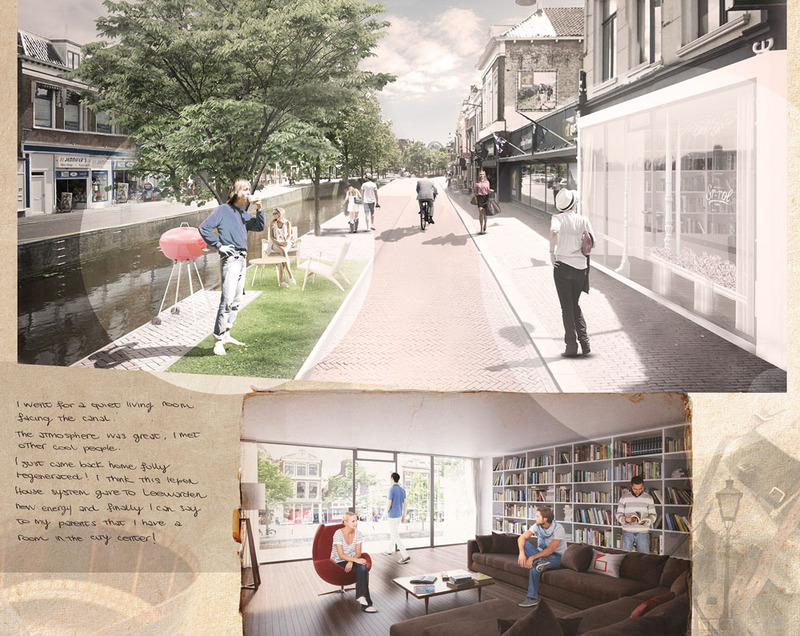 The plan puts forward a number of not really innovative opportunities for dialogue and the jury advises the parties involved in the eastern city centre of Leeuwarden to consult with each other. The Iepen House (= open house) entry presents a strategy based on the idea of sharing space and, more specifically, sharing vacant retail space. The shared spaces add extra quality to the private home or hotel room. The formula comprises four elements: vacant square metres, furniture, the principle of sharing and open-mindedness and efficient organisation. Vacant properties become additional spaces for inhabitants and tourists who are members of Iepen Mienskip, a database for sharing space. The strategy is elaborated further in a number of potential locations in the eastern city centre where revitalisation of the public space and brand-new areas are also proposed. The intention is that the Iepen House concept can also be deployed in other cities with similar problems. In this difficult to fathom plan inhabitants play a central role in the revitalisation in the inner city. Nevertheless, the jury is not sure whether this is a bottom-up or top-down proposal. It provides a toolbox with four tools focusing on improving the competition area as a residential locality instead of revitalising the retail potential. The plan seems more realistic and more achievable than some of the others that tackle the vacancies. The concept of the Wunderkammer is intriguing, but architecturally less successful. The most interesting feature in this entry, however, is the new role for the architect as a social engineer: a discussion about the changing role of the architect is highly topical. This is a conceptual interpretation of the consequences of the rapid technological transformations following the Digital Revolution. 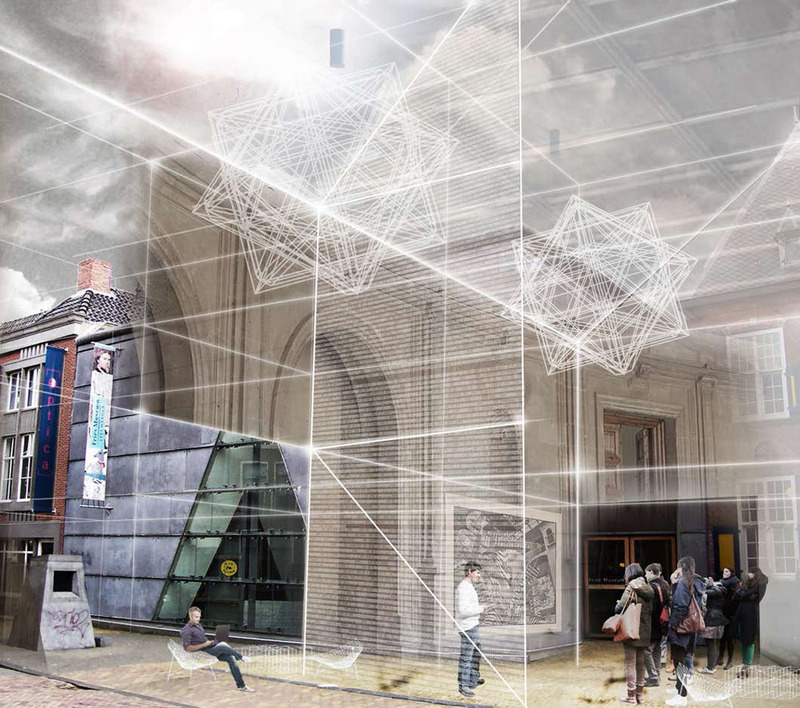 This architectural experiment demonstrates a different typology of architectural space. In order to re-activate the entire city centre and not only parts of it, the project extends the scope of the intervention to a larger area. 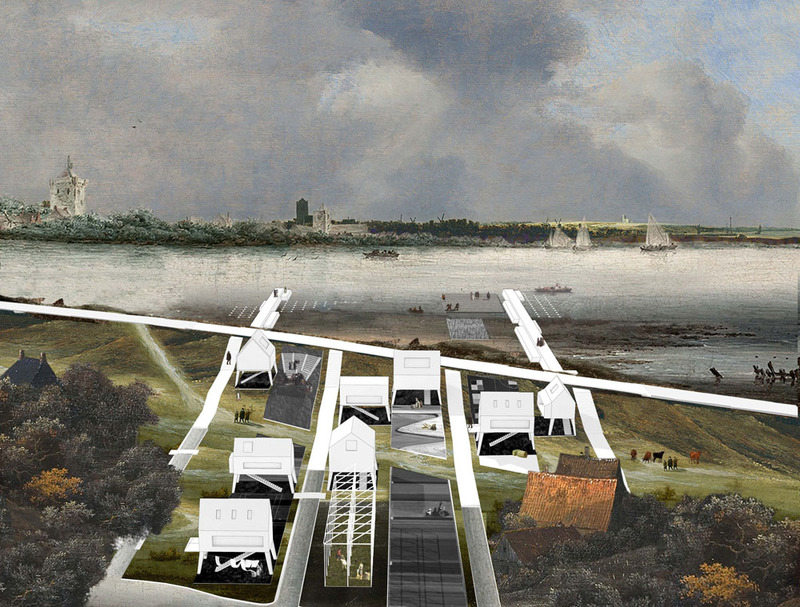 The proposed prototype recurs in several places, thus attracting people and preserving the continuity of urban life instead of further fragmenting it. The Process Structure is a dynamic, interactive, user-generated space in constant motion. The jury views this plan as an interesting conceptual experiment whereby augmented reality and the manipulation of the microclimate are deployed to alter the (perception of) public space. The plan’s non site-specific approach raises the question whether the entry tackles the specific assignment for the site. Be that as it may, it is well connected to events relating to Cultural Capital 2018. Otherwise it could have been anywhere, in addition to the fact that it is an extremely energy-consuming experiment. But the subject of microclimate is highly topical. The jury of Europan 13 NL comprised: Stefan Bendiks (DE) architect and partner, Artgineering; Kaye Geipel (DE) acting editor-in-chief, Bauwelt; Annius Hoornstra (NL) deputy director urban planning and transformation, Municipality of Amsterdam; Judith Korpershoek (NL) architect and partner, Architectenbureau-K2; Marianne Skjulhaug (NO) head of the Institute for Urban Development and Landscape at Oslo School of Architecture and Design; Tjerk Ruimschotel (NL) urban planner and former chairman of BNSP; Esther Stevelink (NL) architect and partner, GAAGA; Sjoukje Veenema (NL) property developer at Lefier housing corporation; Peter Veenstra (NL) landscape architect and partner at LOLA.